It is the sound of squealing wheels skidding hard over the road surface that startles me awake. A second earlier, the driver himself woke to see the brake lights of a stationary vehicle ahead; a red stop sign on Interstate 95 just outside Jacksonville. It is early morning. He has driven through the night while his passengers sleep behind him on the floor of the Ford Transit van. He awakes just in time to hit the brakes before smashing into the car in front. The sleepers hurl forwards smacking against the back of the two front seats, twisting arms and legs, wrenching muscles and, in my case, severing the spinal cord between the 4th and 5th vertebrae. It is the sound of creaking wheels squeaking across polished hospital floors that embarrasses me. I propel the wheelchair for the first time along sterile corridors turning left and right to find an exit. I want to get outside away from the air-conditioned antiseptic sterility, to breathe the fresh air I have watched through the window from a bed to which I have been strapped and trapped for weeks. Suffocated by confinement, I haul myself with aching and shaking arms, performing the unfamiliar motion of self-propulsion until I reach the door and roll out. The air is not fresh at all but dank and heavy in the stale Florida noon. It is the sound of screeching wheels as the plane scorches black rubber streaks along the runway that assures me I am home, returning as a stranger to an unfamiliar landscape where once I walked the moors, rode my horse, paddled in the sea and cycled through country lanes. Now, limited to tarmac pavements and flat city streets, I envy cyclists to whom wheels give wings where mine confine. 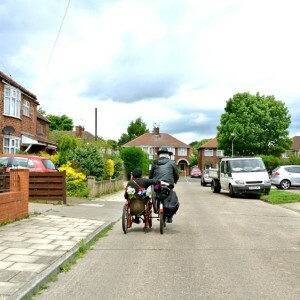 It is the whoosh of wheels spinning, as we speed faster than my wheelchair has ever gone, that transforms my life as we hurtle along the rivers edge, test driving an old cycle-powered wheelchair discovered in the back of a bike shop. 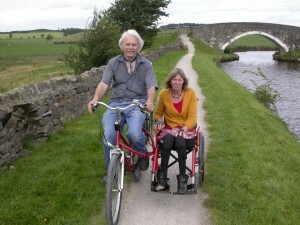 Later Paul peddles out into countryside: along canal paths; by Scottish lochs and shorelines; following Sustrans routes down disused railway lines and quiet rural lanes; embarking on new journeys of discovery. Exploring and together side by side, peddling with rhythmic motion through shifting horizons beneath big skies; shining sun, drenching rain and battering winds, our lives enhanced. It is the sound of cycles, the whir of wheels turning and the humming of tyres that lulls me into hypnotic reassurance. It is comforting to reflect that, inevitably, the wheel will come full circle. Our evolving journeys are never complete. What once evoked fear and then limitation, alienation and now freedom, is merely a vehicle for life’s unfolding. We each roll out a pathway upon the surface of a revolving planet over which most of us walk, many of us fly, swim and dance but around which, with a little help from our friends, all of us can cycle.